What are you using for development? SDL? One is for alternative palettes and the other is to set the bitrate of an image so you could say, set your game to the GBC's screen bitrate. The other is to make a base image match a palette you provide as a texture, and from there you can do some extra effects. Thanks for the suggestions. I haven't thought too deeply about post-processing effects- I've been focusing on the essentials. Is there anything you'd consider essential to pixel-art that requires post-processing? I haven't tried Game Maker, but I hear it's pretty cool. Are shaders and post processing effects essential? No, after all, anything could be done with pixel art with enough time and effort. The point is to reduce the time and effort by providing some standard workflows. Say for example, using the bitrate shader to force an image to conform to a set bitrate for a project to get that extra level of dedication to hardware limitations. Or creating some rendered effects like perlin noise and forcing it to follow a set pallete, creating a voxel mesh from pixel art, generating normal maps and applying phong lighting to pixel art, generating a dithered low color image from a high color digital painting for tasks that might be too daunting for pixel art, like a 960x640 sky. The list can go on. Stuff that might help bridge the gap between digital painting and pixel art. Looking good. Will this be an online app or downloadable too? If possible, maybe you want to move the erasers below the paint bucket because erasers first sets the mood that mistakes, errors and the fuglys come first. Another feature that can be so helpful in planning is the option to have layers. I guess that makes sense bluemagma. I don't really have any plans to implement those types of features since I'm not well versed in programming that sort of thing, but if I get more comfortable with it I may consider it. I think the target audience can probably live without those things anyways, but who knows..
Yeah, game makers are fun to play with. I've used a lot in the past- klik-n-play, the gamesfactory, multimedia fusion, darkbasic, blitzbasic, construct2, unity3d, xna and various other less popular ones which I forget what they're called. Jalonso, I'm developing it as an online app. I haven't looking into downloadable. Everything works in firefox offline, but in chrome the gif export doesn't work offline(it works online though). Also, the wacom tablet web plugin only works in firefox. The main browsers that I'm focusing on are firefox and chrome. It might work in others but I haven't been able to test it. I'll look into the png thing. You can currently output pngs with 3 ways(all frames combined/layered , each frame a separate image, or as a spritesheet).. I'm not sure about the 8bit versus 24, I think it defaults to 24. You can use the frames as layers. So yes, you'll have layers. The thing about png8 vs png24 is that default png (truecolor) is that it alters all colors and is not as pixel friendly as you'd think. Whenever we have fixed color challenges most entries are wrong because most apps output png24. Most PJers are not even aware of this and color shifting questions and confusion abounds. png8(indexed) is the gif equivalent. This image shows the exact same native (psd) file output in the three options. Notice the color changes on the png24. I see no reason in the file format itself to lose precision. Do you know which program(s) cause this difference ? Jalonso, I'm not well versed with that sort of thing, but wouldn't the higher bit depth be more accurate? Isn't a lower bit depth clamped in some way to hold less data if you are converting to it? Colors are adjusted ever so slightly when saving an image that was made in TrueColor (32 bit images, 8 bits per channel [rgba]) to an image format that has less bits and is thus less accurate. Also, Photoshop manages the colors of an image with it's color profiles. It's the reason why some images look bland and desaturated when viewed on the web vs. on a PC image viewer, and why you have to export an image with "Save for Web" in Photoshop. For the most part, you shouldn't have to worry about managing colors yourself, since your program doesn't have color profiles, similar to how GIMP doesn't need to have a "Save for Web" option. 0 (Black) could never become anything but 0 unless the program is doing something it shouldn't. From what I understand all apps/programs will do that on png24 because the file contains less color data in its code or whatever images code into them. I have tested this and indeed even black 000000 changes. Even Photoshop which is widely considered the best image app defaults to png24 if you just save a file. png8 you have to actually go in and choose. The reason png8 was developed was to create the encoding to be 'indexed'. Because colors in pixelart can be almost the most important thing in output then png8 is better than png24. I get questions about shifting colors all the time from PJers and have been collecting data and info and is the reason I brought it up to AlexHW for his app. Then your program is doing something to corrupt it. 0 can never change due to conversion or transformations, only by deliberate additions. Must be some funky color-profile screwing things up!? My Photoshop preserves the correct colors as far as I know. GIF and PNG-8 store color exactly the same way as PNG-24 : a triplet of 3 bytes, allowing 256 levels of R, G and B. As long as your image uses <= 256 different colors, it can be saved as PNG8 with absolutely no loss of information. I just tested with an image saved as png8 by grafx2. I used XnView to convert it to 24bit color space, and save it as PNG again (the program has to switch to png24 variant). The resulting image is identical to the original. So Xnview is not a program which can cause such problem. I don't want Alex's app thread being highjacked so I'll open a thread just for this issue. @yrizoud - I saw the "8" in "PNG-8" and I'm thinking bitrate, but then 8 bits per channel is the usual way a truecolor image is represented. Got a bit confused. 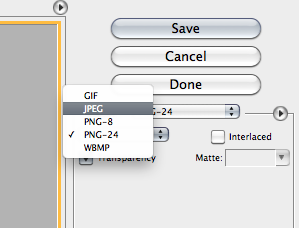 :S After checking out Adobe's documentation, looks like PNG-8 is a more efficient GIF, but lacks legacy compatibility. Back on Topic: Is that brush tool circular regardless of sizing? What's the Softening attribute all about? I don't mind the png discussion, it's interesting to me. Bluemagma, the tool remains circular when sizing up or down, but I'm considering other shapes as well. Hmm, but why would you want that? Unless it like, softens the edge but maintains the current palette. Is that what's going on over there in that scratchpad, some sort of linear progression stepping from one color to another? I was inspired by the HD indexing technique that Dan discovered for photoshop. I went and implemented my own version of this into my editor. In the screenshot you can see how I've chose to connect to color ramps. There's obviously a lot of things photoshop does better, but mine will be free at least. Oh, I like that tool idea. I thought the tool was for making edges semi opaque edges and was concerned. Photoshop is too much for pixelart. As a Mac user I'm limited tho. What is the 1-9 below the colors? Yea, no worries about the semi-opaque edges, my tool keeps everything opaque. The only way at the moment to get semi-opaque colors is to use a frame/layer that has its transparency set below 100. So if you really need to have something semi-opaque, you can do it that way. The 1-9 are connected to your tool presets. You can select a number(or press a number on your keyboard), and whatever adjustments you make to your tool, such as the size, will be saved to that number, allowing you to quickly change between different tool setups. It also gets saved to your browsers local storage so that they remain saved between sessions. The other day I implemented the ability to import a spritesheet because I realized I hadn't done that yet. It had the ability to export a spritesheet, so I implemented importing. Also fixed an issue with drawing straight lines. When you held shift down and clicked, it would draw from the wrong location, but now it works correctly. You can also hold shift and drag to draw horizontally or vertically. fixed an issue with resize handles displaying at wrong locations after dragging a selection. I've added the ability to link together frames in-case you want to keep frames/layers separate yet have them combined in a cell during its animation. also made sure that gets checked when filesaving and loading so that links and opacity and whatnot are accurately maintained. today I fixed it, plus other issues I found in the process. It feels nice to be able to make an animated sprite in the editor. It looks awesome so far. I like the idea of a free pixel-specific tool. And these brushes could be really cool. I used to do large chunks of dithering by hand and then just copied over and over. Dan's technique look good, but complicated. I am to try it yet. Yea, my system makes it a lot easier compared to the method used with photoshop that Dan describes. I've tried that technique, but it's too cumbersome for extensive use. My system that I call the Colordex allows the user to simply draw their color ramps into a palette box(the colordex), and with a couple clicks they're all set to paint with it! edit: as for an official name for the app, I think I have one, but I'm still thinking about it. I hope you found my suggestions useful. looks pretty good.. need to figure a way to speed it up though. Woah nice! Well speed shouldn't been an issue, I'm sure most artists would be more than happy to deal with a delay for that effect. Yeah, the way I've chose to do it for now is using the fast method while rotating, and then when you stop it'll calculate the more refined result. So there's a little delay on it, but not a problem if you have a sense of the angle already, plus it can cancel the refined calculation if you start rotating again before it completes. It's pretty much working how I want it to, but there are some things that could be improved. One being that if you rotate and then want to resize, it'll revert to the non-rotated version(unless you apply the rotation to the layer first). Reason for this is in relation to wanting to maintain the original detail throughout the modifying process so that you aren't continuing to morph it beyond recognition. I personally can live with that, and I'm unsure how much of an issue that would be for others. Maybe some of you can give me your opinions. Would it bother you if you rotate something and then resize it, that it would revert the rotation(you'd have to resize first if you intend to rotate, because resizing a rotated selection will resize from the non-rotated image). Can I ask which rotation algorithm you're using ? I tried to implement what the rotsprite does, but since there's no full documentation on how that is done I'm adding in my own stuff for cleaning up odd pixels. The resize part of the algorithm should be relatively the same though which uses a version of the scale2x algorithm. So I can't really call it the rotsprite algorithm, though it is inspired from it. It would bother me if transforming it reset the rotation, since you could just undo if you wanted a non-rotated version. You motivated me to spend some more time looking at the issue- I think I've figured out a way to maintain the rotation while resizing. Edit: okay I have it functioning now. Damn... If you need help... I'm a developer. I hope you're not getting sidetracked by fancy effects at the expense of basic functionallity...at this early stage. If the basics don't work well, nobody will stay around long enough to try the more advanced features. DawnBringer, I'm focusing on the essentials foremost. I've been working on the rotation/resize stuff lately.. Now it looks and functions great! Wow! This looks like it is going to be a great tool! Scaling/rotation is working nicely but to me is not that cool for pixelart. Thanks for the offer Sendoushi. boogieman, it'll have everything you need to make pixel-art, so hopefully a lot of people will find it useful. That being said, if anyone has suggestions for what they think are necessities for making pixel-art, let me know. jalonso, yeah, I try to avoid rotation when I create pixel-art because it can promote bad habits if you use it for animation. Also, usually the rotation messes the pixels and you have to redraw it anyways. I prefer just redrawing something instead of rotating it. So It was never high on my priorities to include rotation at arbitrary angles, plus i knew it would be difficult to implement, but somehow it evolved and I figured some people would want it to use it, so I might as well make sure it functions great so that those people don't feel limited if it is something they need. Hey, please leave me an e-mail whenever you release the tool to include it in this list. That's a nice list you've compiled. I'll remember to do so. As to the development, all the main features are pretty much done, so lately I've been going through everything cleaning up any rough edges or things I may have overlooked. I'm sure there will be things that need addressing when more people start playing with it, which shouldn't be too long from now. Yes, it can be used offline. I had some features planned for managing unused colors, but had forgot about those- thanks for reminding me. As to working with the palette, can you give some examples as to what control you want over that? You could use a wrapper library and make your code into local binaries. A lot of people have been using node-webkit, so you could try that. EDIT: It's used by Intel, Koala IDE, PrePros, Game Dev Tycoon, and a bunch of others, so it's got a pretty good standing. Also, any plans of githubing this project?